A 30-minute drive gets you to roadhead at Stok, from where the trek begins. The trail goes through the village and, keeping to the true left bank of the Stok Nala, climbs gradually for an hour past fields of barley, enclosed gardens and a few apricot orchards, to the head of the alluvial plain where it enters the gorge of the stream. The trail is well worn, used for the summer movement of cattle and sheep to the higher pastures and by donkey and dzo columns carrying food and other supplies between the camps and the villages. About three hours into the day's walk, where a spur forces the river to take a sharp turn, pass the jagged ruins of the Staklang Khar fort, supposedly dating back to the 13th or 14th century, which dominates the upper part of the gorge. At its base is a thick grove of willow which serves as a pleasant spot for lunch. From here the trail climbs steeply for a short distance to a saddle called Ton Ton, with its ritual cairn of rocks, decked with prayer flags and topped with the skulls and horns of Bharal (blue sheep), common in this area. From here it drops down to the stony bed of the river and continues upstream, past the summer camp or doksa of Chortenthang to below another doksa at Mankyurmo, where camp is set for the night. Leaving Mankyurmo, the trail crosses a stream to the doksa of Jurles, the stone huts piled high with drying Caragana, Linicera and Acantholimon bushes, used for fuel. In mid summer even the driest parts of this area have tiny flowers and flowering bushes and in the meadows where water is close to the surface, bright patterns of yellow, pink and blue can be seen. The climb up to Matho La is extremely strenuous and at the top, The initial descent to the plain of the Upper Matho valley is steep. At the end the trail crosses a couple of streams and camp is set near Gyangpoche doksa. The pasturage of the Upper Matho is a huge area bisected by streams.Overnight camping. The first part of the day's walk goes eastwards across the plain, to the edge of the pastures. In this area a large number of streams, rising in the snowfields of the Stok Matho range, have gouged deep valleys as they flow north and converge to form the Matho river. The trail descends to the bottom of one such valley and it takes over two hours to reach the stream which has to be forded. Camp is set on the bank of another stream. Overnight camping. Crossing the stream, the trail climbs up the opposite hill past a number of small doksas. Three to four hours of steady walking through relatively barren country leads to Shang La which links the Matho valley with the Shang valley. From here the view to the south is spectacular. Camp is set on the tongue of land formed at the confluence or, after crossing the small stream, on its true left bank. The trail goes through the lovely small village of Shang some two hours after leaving camp. Perched high above to the left of the trail is the old gompa dominating this valley with its stone fences and complex braided irrigation system. Reach at Sumdo means 'confluence' and is therefore a very common name for villages. 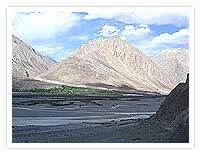 Trek until it opens onto the wide valley of the Indus. 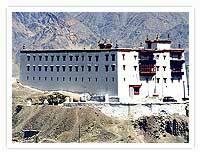 Vehicles await here for the one-hour drive to the Ladakh Sarai.